The Philip Morris earnings report had some key insights into trends that will shape the global tobacco industry for years to come. Recently, investors in Philip Morris International (NYSE:PM) have had to deal with some difficult times, as prospects for the global tobacco industry have looked a lot less certain than they did in years past. Coming into the most recent quarter, investors worried when Philip Morris cut its earnings guidance for the full year, citing currency concerns and pointing to falling cigarette volumes that have led to factory closures. Although its actual report last month helped ease some of those fears, Philip Morris still has a big challenge to overcome, and as global conditions change for tobacco companies, it's far from a given that the tobacco giant will find the same success it has in the past. Philip Morris had revenue of $7.8 billion, down 1.5% from the year-ago quarter. Yet that decline was actually less severe than investors had expected, and many took heart from the fact that the strong U.S. dollar accounted for the entire decline and then some. When you take out currency effects, Philip Morris managed to grow sales by 4.5%, overcoming a decline in volume because of increases in the prices it was able to charge for its products. On earnings, Philip Morris also saw substantial declines, with net income of $1.85 billion representing a 13% decline from year-ago levels. Earnings per share only fell 10% to $1.17, though, and on an adjusted basis, Philip Morris managed to boost per-share income by 8.5%. The resulting figure of $1.41 per share was quite a bit higher than forecasts of $1.24 per share. Philip Morris reaffirmed its guidance for the year, reassuring investors that at least things wouldn't get any worse than the company's prior earnings warning had suggested. Philip Morris still believes it can earn $4.87-$4.97 per share for 2014, which at current share prices translates to an earnings multiple of about 17. 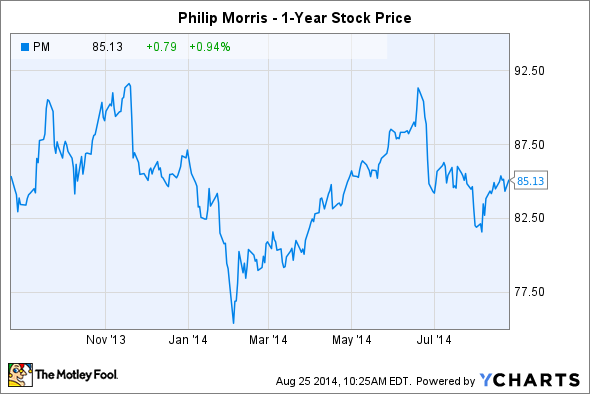 The problem that Philip Morris faces, however, is much longer-term in scope. The company warned that "known business challenges" in Asia would likely hold back growth during the rest of the year. So far, the strength and popularity of the Marlboro brand has been sufficient to allow the company to boost prices while still retaining, and even building, market share in some areas. But the most troubling problem is the decline in cigarette volume. Long-time shareholders will recall that one of the reasons why Altria Group (NYSE:MO) spun off shares of Philip Morris International was the perception that the international business would be less prone to adverse trends in the tobacco industry than the U.S. business. Cigarette consumption has fallen for decades in the U.S., but investors believed that regulation in other areas of the world would remain lax and allow Philip Morris to capitalize on its globally known brand in an environment in which a rising consumer class would smoke more and boost profits. Yet that hasn't been the case, and the trend seems to be toward more regulation. In the earnings report, Philip Morris said that discounting and consumer behavior would hit sales in Australia hard, and the result could be less growth in currency-neutral earnings per share than the company had expected. Regulation has also driven many industry players in the U.S. and internationally toward electronic cigarettes, with Philip Morris having bought U.K.-based Nicocigs Limited in late June in order to bolster its presence in the growing market. E-cigarettes are currently in a regulatory vacuum, but policymakers are rushing to fill the void, and it's far from clear whether the booming new industry will sustain its impressive growth once regulators decide how to treat electronic cigarettes. Philip Morris shares haven't performed well since last month's earnings announcement, and investors are clearly worried about the doubts they have about the global tobacco industry's future. With the pace of regulation growing more quickly than most people anticipated, Philip Morris will have to work hard to overcome future regulatory hurdles and produce the profit growth that investors counted on when they bought the stock.